Here at Excelsior we’re known not only for the fantastic quality of the bespoke products we can provide using our rotomoulding service, but also the great range of standard plastic products available on our site. 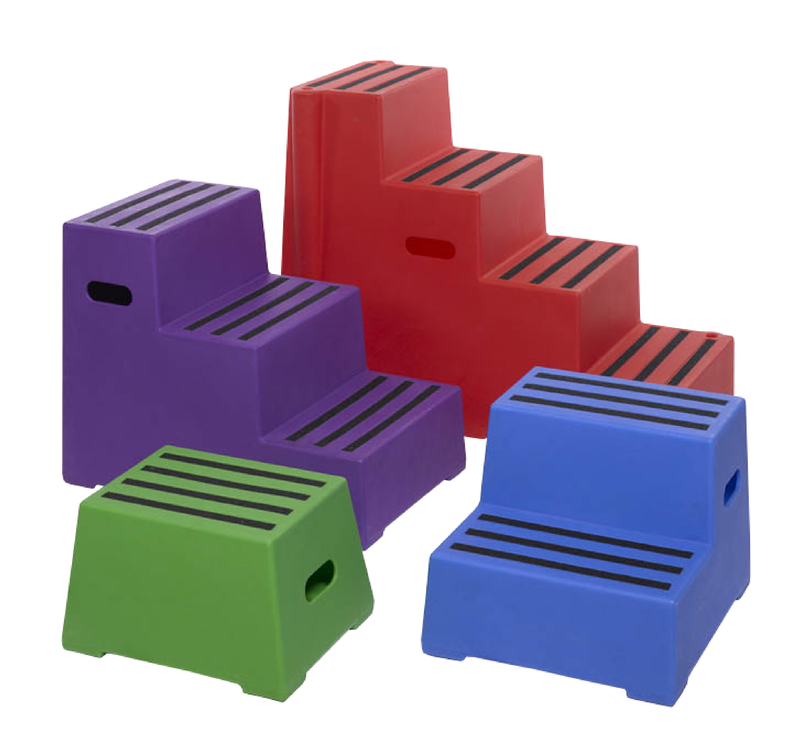 One of these is our range of heavy duty plastic safety steps. We regularly supply these to some hugely recognisable companies – UPS use them in the back of the delivery vans; Amazon use them for order picking in their warehouse and Flybe use them when working under their planes in the hangars. Below, we’ve summed up a few reasons why they’re so helpful, and how they can be of use to your business! Safety is obviously our first consideration in the manufacture of our safety steps, and we’ve manufactured them with a number of features that ensure that they retain this safety value across a diverse range of environments. Each step is fitted with abrasive strips for sure footing, and all models can support loads of at least 180kg. (Our Heavy Duty Safety Steps can even support loads of up to 260kg.) The four step is also available with a powder coated short steel handrail, to provide the user with added safety and stability. The steps are made from food-grade material with a UV stabiliser, which ensures that the steps can be used in almost any environment, indoors or outdoors. They’re capable of standing up well in a broad temperature range, spanning from as hot as 60 degrees to temperatures as low as -20. They’re also resistant to most chemicals, making them safe and hygienic for active shop and factory floors. Unlike larger-scale access equipment, the lightweight nature of our plastic safety steps means that they can be easily transported across relatively long distances, such as factory floors, gym facilities or warehouses (to name just a few!). The steps themselves aren’t heavy, with various models weighing 5kg, 10kg, 15kg and 20kg respectively. What’s more, the job of transporting them is made even easier due to the cut out hand-holds on either side. These qualities – in addition to their compact size – also mean they’re easy to store, making them a highly versatile solution for many businesses. We’ve talked a lot on the blog before about the general durability of the plastic materials we use here at Excelsior. Our roto moulding process creates products with hardy wall thicknesses. In the case of our safety steps, they boast a typical wall thickness of 10mm, which is more than enough to stand up under the regular knocks and bumps they’ll likely be subjected to in their day-to-day use. This durability gives them fantastic value, as they’ll give you a long lifetime of service. While this is generally a secondary concern, the bright colours of the safety steps does serve yet another useful purpose; making them easy to see in darker or poorly-lit environments, so reducing the chances that anyone will trip over them! Plus, it gives you the option to choose the colour of safety steps that best suits your branding, giving you a chance to reinforce your image and values onto visitors. You can take a look at our various safety steps here – our Heavy Duty safety steps are stocked throughout the year across all sizes, in red, yellow and blue. More technical data is available on the product pages themselves, and if you’ve got any questions or you’d like to place an order, we’re only a phone call away on 0161 765 2010.